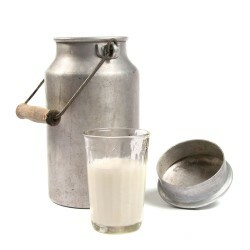 The main source of milk for consumption is represented by the cow's milk, but other mammals, contribute to human milk food: cow buffalo (India, China, Egypt, etc..), goat (in the Mediterranean), reindeer (Eastern Northern), sheep (in southern Europe, where milk is mainly used to produce cheese). It is usually pasteurised and sometime homogenised. In pasteurisation, the milk is heated to a high temperature to sterilise it and destroy bacteria without making it taste. Homogenisation breaks down the globules of fat so that they remain in solution; this makes the milk more digestible. Ultra-heat treated (UHT) or long life milk is homogenised then briefly heated to an ultra-hight temperature which keeps it fresh for months.